Aim: To evaluate sealing properties of different obturation systems placed over apically fractured rotary NiTi files. Materials and Methods: Forty freshly extracted human mandibular premolars were prepared by using Protaper (Dentsply-Maillefer, Ballaigues, Switzerland) or the RaCe (FKG Dentaire, La Chaux-de-Fonds, Switzerland) systems (n=20 for each), after which half of the specimens were subjected to instrument separation at the apical level. Roots with and without apically separated instruments (n=5) were filled with the two obturation systems i.e. Thermafil and lateral compaction technique. The modified glucose penetration setup was used to assess the microleakage. The leakage data was statistically analyzed. Results: The amount of leakage was significantly lower in specimens containing fractured instruments, regardless of the obturation method used. Roots obturated with Thermafil displayed significantly less leakage than cold lateral compaction technique, both, in the presence and absence of separated instruments. There was no significant difference among specimens prepared with ProTaper and RaCe when Thermafil obturation was done. But with cold lateral compaction technique, RaCe system showed less leakage as compared to ProTaper system. Conclusion: The type of obturation may play more important role than the type of instrument or retained/non-retained instrument factor. A variety of instruments and techniques to remove broken instruments are now available; however, still at times they are not successful. Some studies suggested that in most cases where separated instruments are impossible to retrieve, the retained fractured instrument can be incorporated into the final root canal filling [Table 1], [Figure 1] and [Figure 2]. In such type of cases, a good quality obturation is required so that the sealer or the obturating material may seal the spaces between the flutes of the broken file resulting in an adequate apical seal. There are a variety of techniques used to obturate the root canal system, which can be divided into two basic groups: Cold lateral compaction or warm vertical compaction. Lateral compaction which is widely used by practitioners and is a proven clinically effective filling technique, is still the standard to which all other techniques are compared. Nevertheless, some studies report the creation of voids, spreader tracts, excessive volume of sealer, and lack of surface adaptation to canal walls. It has been shown that thermoplasticized Thermafil provides a void free obturation along with minimal sealer thickness and a higher degree of homogeneity. Previous studies shows conflicting results regarding the role of apically fractured files in the sealing ability of the obturating material. ,, Although the sealing properties of different obturation systems over apically fractured rotary ProFile and ProTaper files have been investigated,  the effect of apically fractured RaCe on the overall sealing performance is still unknown. 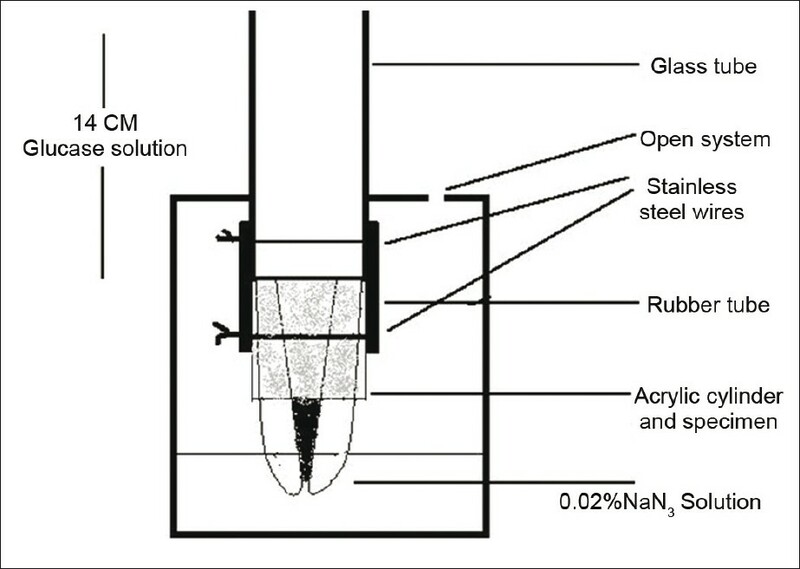 Consequently, the aim of this study was to investigate the sealing properties of two different obturation systems (cold laterally compaction technique and Thermafil obturation) placed over different apically fractured rotary NiTi files (Protaper and RaCe) using modified glucose penetration model. Forty freshly extracted mandibular human premolars, macroscopically similar in size and with straight and single root canals, were selected. The external surfaces of the teeth were cleaned using ultrasonic instruments and were stored for one week in formalin for disinfection, and were then stored in normal saline until use. All the specimens were examined under a stereomicroscope to ensure the absence of cracks. The length of the tooth was determined with a # 10 K file until it was just visible at the apical foramen. The coronal part of the tooth was sectioned using a diamond disc so as to obtain a final dimension of 12 mm. The working length was then determined by subtracting 1 mm from this canal length. The roots were randomly assigned into two groups for root canal preparation with either the Protaper or the RaCe systems. Each group was further divided into 4 subgroups on the basis of the presence/absence of instrument fracture and final obturation method used. Protaper files were driven at 350 revolutions per minute (rpm) at a torque of 2 Ncm with an endodontic micromotor (XSmart, Dentsply-Maillefer, Ballaigues, Switzerland). Between successive files, roots were copiously irrigated with 2.5% Sodium hypochlorite (NaOCl) and the tip of each file was covered with RC-Prep paste (RC-Prep; Premier Dental, Norristown, PA). In subgroups IA and IB (n=5 for each subgroup), the preparation of the roots were completed by using F2 files without the instruments being separated. The master apical file F2 was selected because in a pilot study, F2 file predictably touched the canal walls at the full length. In all groups, the roots received a final irrigation of 5 ml of 17% Ethylenediaminetetraacetic acid (EDTA) and 5 ml 2.5% NaOCl, after which the canals were flushed with 10 ml distilled water. In subgroups IC and ID (n=5 for each subgroup), preparation was continued until the F2 file advanced to 2 mm of the working length. Thereafter, a new F2 file, previously nicked with a diamond bur 3mm from the tip to facilitate separation, was introduced with constant pressure until separation occurred in each specimen. The uniformity of applied force was confirmed by the bar display on the XSmart unit whose halfway distance corresponded to approximately 1,000 g of compressive force. After instrument separation, the teeth were radiographed again to ensure that the separation occurred in the apical third of the canal. Root canals were obturated with ProTaper cones and AH Plus sealer. All specimens required lateral compaction. This was done by inserting 0.02 taper # 15 and #20 spreader to the maximum depth possible, followed by placement of corresponding size 0.02 taper #15 and #20 accessory gutta percha cones coated with the sealer. Root canals were obturated with AH Plus sealer (Dentsply, Caulk, Milford, DE) and size #25 Thermafil obturators. The diameter of the tip of the separated file was measured with a gutta percha gauge, and a single protaper gutta percha point (Dentsply-Maillefer, Ballaigues, Switzerland)), corresponding to a size F2 file, was trimmed to the same tip diameter with a scalpel. The canals were sealed with AH Plus sealer (Dentsply Caulk, Milford, DE) using a lentulo spiral before placement of the modified cone. All specimens required lateral compaction with accessory gutta percha cones of size 0.02 taper with # 15 and #20. A Thermafil obturator (Dentsply-Maillefer, Ballaigues, Switzerland), whose size was adjusted as with protaper points in subgroup IC, was heated in a Thermaprep oven (Dentsply- Maillefer, Ballaigues, Switzerland) for 30 seconds. For the purpose of standardization, AH Plus sealer was applied into the canal. The thermafil obturator was slowly inserted into the canal to the working length with firm pressure. Excess material was removed with thermocut (Dentsply-Maillefer, Ballaigues, Switzerland). Roots were obturated with the cold lateral compaction technique. The master gutta percha cone had a tip size of 25 and 0.04 taper corresponding to the master apical file. The accessory gutta percha cones were of size 0.02 taper with #15 and #20. A # 25 Thermafil obturator was placed as with group IB. A # 25, 0.04 taper gutta percha cone (Dentsply-Maillefer, Ballaigues, Switzerland) was modified and applied into the canal as described in subgroup IC. The roots were filled with a modified Thermafil obturator as explained in subgroup ID. After obturation, the specimens were stored separately for 1 week at 37°C and 100% humidity to allow for the complete set of the sealer. For both Ni-Ti systems, three additional specimens per group were prepared and left unfilled to serve as positive controls. For negative controls, three specimens per group were filled with laterally compacted gutta percha and AH Plus and completely covered with nail varnish. A modified glucose penetration setup was used. , The coronal 4 mm of the root specimens were embedded in acryl to form an acrylic cylinder around the root and enable leak free contact between the rubber tube and root specimen. The resin block around the coronal part of each root was connected to a rubber tube and the adaptation was improved with stainless steel wires. The other end of the tube was similarly connected to a 16cm long pipette (Pyrex, Acton, MA). The assembly was then placed in a sterile glass bottle with a screw cap and sealed with sticky wax, and a uniform hole was drilled in the screw cap with a size 173 diamond bur to assure an open system at all times. All specimens were then returned to the incubator at 37°C for the duration of the observation period. A 25 μl increment of solution was drawn from the glass bottle using a micropipette at 1, 2 and 3 weeks. The same amount of fresh NaN 3 was added to the glass bottle reservoir to maintain a constant volume of 2 ml. The sample was then analyzed with a spectrophotometer (Spectromax plus, Molecular Devices, Sunnyvale, CA) at 340 nm wavelength. Concentrations of glucose in the lower chamber were presented in mg/L at that particular time after obturation. The lowest glucose level for which the current procedure is believed to be accurate is 0.0663 mg/L, which derives from an absorbance difference of 0.020. Below this level, the absorbance readings become relatively small, and results are subject to greater error from technique variables. The data was subjected to statistical analysis. Repeated measure Analysis of Variance (ANOVA) was done at different time intervals followed by post hoc Bonferroni correction to compare different groups and subgroups. As the three different factors, i.e. type of instrument used for preparation, presence or absence of fractured instrument and the type of obturation, were interacting simultaneously and influencing the results, a multifactor regression analysis was done to determine their influence. The level of significance in all tests was set at P<0.05. The leakage was shown by all specimens which increased progressively over time. Among all groups, specimens with fractured ProTaper instruments and obturated with Thermafil showed the least amount of leakage, whereas the highest leakage was observed in canals prepared with ProTaper files and obturated with ProTaper cones. 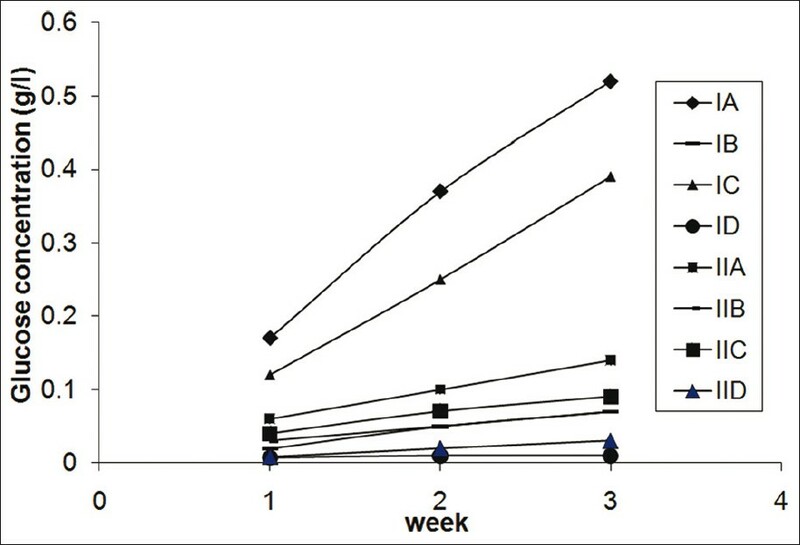 Positive control samples exhibited substantial amount of leakage in the first week itself. Negative control specimens showed no detectable glucose penetration. Roots obturated with Thermafil displayed significantly less leakage than cold lateral compaction technique both in the presence and absence of separated instruments. There was no significant difference among specimens prepared with ProTaper and RaCe when Thermafil obturation was done. However, with cold lateral compaction technique, RaCe system showed less leakage as compared to ProTaper system. Among the three factors influencing the results, the regression coefficient for the type of obturation was maximum (0.16), followed by the type of instrument (0.11) and the presence or absence of fractured instrument (0.05). Hence, the type of obturation plays a more important role than the type of instrument used for preparation and the presence or absence of fractured instrument. Different methods have been used to detect and measure leakage along root fillings. In the present study, the modified glucose penetration model , was used which is believed to be more sensitive and allows measurements of diffusion of the marker molecules as well. Glucose as a marker in leakage studies has clinical relevance because it is an important nutrient for microorganisms and even at very low concentrations, a biofilm is able to survive. As it is impossible to remove the biofilm completely from the root canal,  leakage of very small amounts of glucose could help the biofilm survive or promote its regrowth when left in the root canal after preparation. The difference between the current version of the glucose penetration model and the original model introduced by Xu et al.,  lies mainly in the environment where the models were stored. In order to prevent evaporation of fluids, the models were placed in a closed jar with 100% humidity. Cold lateral compaction with ProTaper gutta percha cones used with ProTaper system showed more leakage as compared to Cold lateral compaction with gutta percha cones of constant taper (0.04 taper) used with RaCe systems. The coronal end of these variable tapered gutta percha points is wider than constant tapered conventional gutta percha, which prevents a good lateral compaction. Thus, the ultimate filling is probably a combination of a less than ideal compacted cone with a relatively larger amount of sealer. This was also observed in a study by Yucel and Ciftii,  in which protaper single cone displayed the fastest bacterial penetration among 5 different obturation methods. Obturations with the separated ProTaper file showed less leakage as compared to obturations without separated file in cold lateral compaction. File separation in this study apparently occurred as a result of stress that was created through increased contact and binding of the file within the canal. The screwing force that led to the separation of files could have forced the instrument firmly into the dentin, allowing a more intimate contact between the file and the root canal walls at the apical third, thus a less fluid conductive interface is created, and a good apical seal is achieved inspite of poor lateral compaction associated with ProTaper cones. In the present study, leakage in roots with retained fractured ProTaper and RaCe and obturated with Thermafil showed insignificant difference. Less leakage with retained ProTaper in this is in accordance with the previous study by Altundasar et al., who reported that roots with fractured ProTaper files showed the least leakage, but the roots with fractured Profile fragments showed the highest leakage. This was because of the differences in the design of the systems. Profile instrument has U shaped groove with radial lands and a central core which lead to debris lodgement. This prevents the thermoplasticized gutta percha to flow between flutes resulting in poor seal. In the present study, both ProTaper and RaCe have triangular cross sectional design with sharp cutting edges and no radial land which results in better debris removal. Hence, the thermoplasticized gutta percha can seal the spaces between the flutes of the broken instrument resulting in good seal for both the ProTaper and RaCe. The type of obturation may play more important role than the type of instrument or retained/non-retained instrument factor. In such type of cases, a good seal may be achieved with Thermafil obturation which provides significantly better seal than cold lateral compaction irrespective of the taper of the master cone used for lateral compaction. 1. Grossman LI. Fate of endodontically treated teeth with fractured root canal instruments. I Endod J 1968;2:35-7. 2. Spili P, Parashos P, Messer HH. The impact of instrument fracture on outcome of endodontic treatment. J Endod 2005;31:845-50. 3. Hulsmann M. Removal of silver cones and fractured instruments using the canal Finder System. J Endod 1990;16:596-600. 4. Souter NJ, Messer HH. Complications associated with fractured file removal using an ultrasonic technique. J Endod 2005;31:450-2. 5. Saunders JL, Eleazer PD, Zhang P, Michalek S. Effect of a separated instrument on bacterial penetration of obturated root canals. J Endod 2004;30:177-9. 6. Mohammadi Z, Khademi AA. Effect of a separated rotary instrument on bacterial penetration of obturated root canals. J Clin Dent 2006;17:131-3. 7. Altundasar E, Sahin C, Ozcelik B, Cehreli ZC. Sealing properties of different obturation systems applied over apically fractured rotary nickel titanium files. J Endod 2008;34:194-7. 8. Xu Q, Fan MW, Fan B, Cheung GS, Hu HL. A new quantitative method using glucose for analysis of endodontic leakage. Oral Surg Oral Med Oral Pathol Oral Radiol Endod 2005;99:107-11. 9. Shemesh H, Wu MK, Wesselink PR. Leakage along apical root fillings with and without smear layer using two different leakage models: A two month longitudinal ex vivo study. Int Endod J 2006;39:968-76. 10. Ozok AR, Sluis LW, Wu MK, Wesselink PR. Sealing ability of a new polydimethalsiloxane-based root canal filling material. J Endod 2008;34:204-7. 11. Siqueira JF. Aetiology of root canal treatment failure why well treated teeth can fail. Int Endod J 2001;34:1-10. 12. Ricucci D, Bergenholtz G. Bacterial status in root filled teeth exposed to the oral environment by loss of restoration and fracture or caries: A histobacteriological study of treated cases. Int Endod J 2003;36:787-97. 13. Gopikrishna V, Parameswaren A. Coronal sealing ability of three sectional obturation techniques-SimpliFill, Thermafil and warm vertical compaction compared with cold lateral condensation and post space preparation. Aust Endod J 2006;32:95-100. 14. Gulsahi K, Cehreli ZC, Kuraner T, Dagli FT. Sealer area associated with cold lateral condensation of gutta-percha and warm coated carrier filling systems in canals prepared with various rotary NiTi systems. Int Endod J 2007;40:275-81. 15. Collins J, Walker MP, Kulild J, Lee C. A complication of three gutta percha obturation techniques to replicate canal irregularities. J Endod 2006;32:762-5. 16. Yucel AC, Ciftci A. Effects of different root canal obturation techniques on bacterial penetration. Oral Surg Oral Med Oral Pathol Oral Radiol Endod 2006;102:88-92.